Outlaw King is finally available for fans to stream right now on Netflix! The Netflix Release Date is November 9, 2018. Watch trailers, casting news and everything else you need to know. The untold, true story of Robert the Bruce who transforms from defeated nobleman to outlaw hero during the oppressive occupation of medieval Scotland by Edward I of England. Despite grave consequences, Robert seizes the Scottish crown and rallies an impassioned group of men to fight back against the mighty army of the tyrannical King and his volatile son, the Prince of Wales. Filmed in Scotland, OUTLAW KING reunites director David Mackenzie (Hell or High Water) with star Chris Pine alongside Aaron Taylor-Johnson, Florence Pugh and Billy Howle. 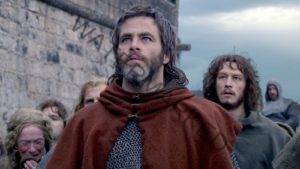 Watch Outlaw King’s Trailer here. When is Outlaw King out on Netflix.com? If you like what read about Outlaw King, please remember to share Netflix New Releases on Facebook, Twitter or wherever you guys want it’s all appreciated.